At least 2 great coaches I remember were on that team. DC Wilcott was very successful at CBC and Hank Raymonds coached at SLU and then up at Marquette with RM! There were probably others, but I don't know about them. Anyone else? How many of these guys are still living? Most would be in their early 80s by now. Miller, Macauley are still alive. Tony Rubich has passed away. Not 100% about the others. The 1997-98 edition of the basketball Billikens have hopes built largely around a recruiting class composed of talented players from the St. Louis metropolitain area. If this current cast can bring the kind of championship play that another group of native St. Louisans did 50 years ago, then Billiken fans will revel in excitement that they have not experienced in quite a long time. The 1947-48 were led by legendary Billiken coach Eddie Hickey, who was in his first season. Saint Louis had enjoyed a wonderful season in 1946-47 by finishing with an 18-11 record and a first place finish in the Missouri Valley Conference with an 11-1 mark. They wouldn't be able to repeat the conference championship in 47-48 and finished second in the MVC with an 8-2 record. But bigger things were coming. "Easy" Ed Macauley was a young player, who was about to come of age and lead Saint Louis to a basketball national championship(back then the NIT was the nat'l championship tournament). Macauley was a third team All-American as a sophomore when he averaged 13.6 ppg. He returned in 47-48 for his junior season and again averaged 13.6 ppg, but was named first team All-American by both wire services, The Sporting News and the Helms Foundation. He was considered the best defensive center in college basketball. The Billikens grabbed the NIT title by beating New York University 68-52 in the championship game. Macauley led all scorers with 24 points. Joining Macauley in the lineup were Joe Ossola and D.C. Wilcutt at the forwards along with Danny Miller and Bob Schmidt in the backcourt. The top reserves were Marv Schatzman and Lou Lehman. The Billikens were known for their fastbreak style. In a 1994 interview with the Post Dispatch's Dave Dorr, Schatzman said," We believed we had a coach who knew the game, and we dedicated ourselves to playing for that guy. He brought something of a thoroughness to the game I never thought existed"
Lehman described the team's style to dorr. "We had good speed, played defense and there was no selfishness," Lehman said. " The New York sportswriters talked about how fast we were." Schatzman told Dorr about the celebrity of it all. "For the first time, I knew what it was like to be a hero" Schatzman said. "We were national champs. You couldn't take your girlfriend to the movies because everyone knew who you were. If you went down to the fox and tried to sit upstairs, people recognized you even in the dark!" 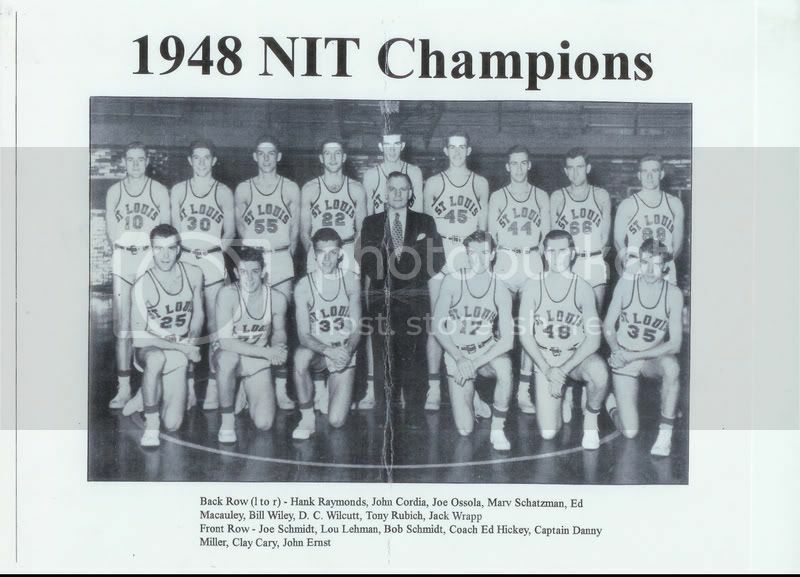 The NIT title is a landmark for basketball tradition at Saint Louis. When Saint Louis fans look back to highlight the first truly significant historical moment in Bills' hoops, they always reflect upon that title, which was considered the national championship at that time. "Prior to the NIT Championship Saint Louis had some good teams, but basketball wasn't a factor yet in the community," Macauley recalled. "People focused on Indiana or Illinois. But once we won the NIT, people could associate with it." "One of the big things was that we had all guys from St. Louis. We had guys who had fought in the way. Everyone remembers the reception that we got at Union Station when we returned. On Sunday March 21, 1948 the Billikens were welcomed home by a crowd estimated at 15,000 at Union Station. The players were driven to campus in cars decorated with blue and white crepe paper. A special noon mass was celebrated. Macauley saw the original wave of community support for Billiken basketball. "We started out playing in West Pine Gym," he remembered. "But we got Notre Dame on the schedule and played them at the old Kiel Auditorium. An hour before the game, we couldn't get near the place! They had to turn people away. "When we won, we filled the place. Being part of that growth of a program was fun and memorable"
Except for Ossola(Collinsville, Ill) and John Ernst (Decatur, Ill.), all of the 47-48 Billikens were from St. Louis. Nine Members of that team still live in the St. Louis area: Macauley, Lehman, Wilcutt, Schatzman, Ossola, Miller, John Cordia and Clay Cary. Three are in other cities Hank Raymonds and Carl Weisner in Milwaukee and Jack Wrapp in Denver. Five are deceased Bill Wiley, Ernst, brothers Bob and Joe Schmidt and Tony Rubich. "Nothing tops that 1948 win," Wilcutt said. "The Union Station crowd that welcomed us home was unbelievable." The current Billikens hope to be able to capture that same feeling. Great reading and thank you. Here's hoping that SLU honors this team this season. I remember as a kid when Ed Macauley was the color analyst on the Missouri Valley Game of the Week that was played at 12:30 on Saturday afternoons. He was also the sports guy on Channel 2 when it was an ABC station. If memory serves me correct,in the 48-49 season,the Bills were voted #1 in the first ever AP poll. Memory of what you've read or memory of your experience? I wasn't even born until 20 years later. This is true. An answer to a tough trivia question. Tony Rubich was my (and others' on this board, I'm sure) HS gym teacher. He coached C basketball, but I don't remember if he was ever a varsity coach. The downside of the '48 achievement, as I've mentioned before, was that, we when arrived in StL in 1965, everyone was still talking about it like it had just happened a couple of years before. PS -- I'm not certain, but I think Tony was responsible for a quote that has lived in infamy in my and many of my classmates' minds: "All right you guys -- pair off in threes!" So we're the first, best basketball team ever. Technically. I'll make sure to use that next time we get f'ing trounced and someone asks WTF is a Billiken anyway. "If you want Billiken, what the hell is Billiken anyway!?!? 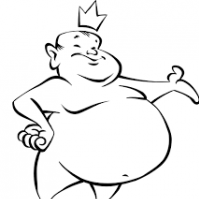 Shut up with the Billiken..."
Don't remember that quote. A good one it is, though! Also don't think he coached varsity basketball. But he did coach varsity baseball at the Uhigh.